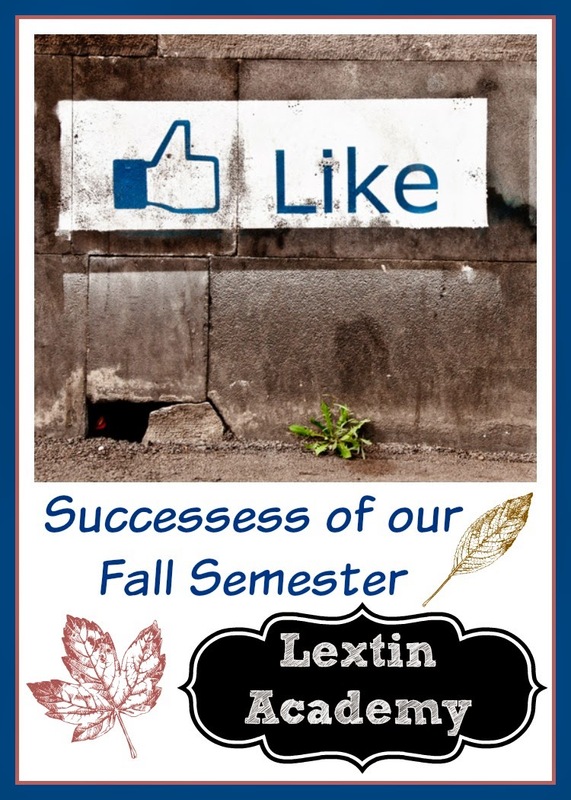 In looking back on our fall semester I’ve realized that we’ve had some great success. Here is what is working for us right now. This year we’ve had some serious success with the curriculum I’ve chosen. Overall, I’m still happy with our line up. Our main subjects of language arts and math are amazing. Right Start is a major success for all of my children in math. We are also loving First Language Lessons for both Tiger and Curly. It is a great intro to grammar that is incremental. My kids also enjoy Writing with Ease (which still kind of shocks me). They love the story excerpts and I can tell how the questions and summaries make them think about what we’ve just read. Tiger and Bee are both doing well in their levels of All About Reading and I know that I will soon have two new fluent readers. I’m so excited about that! Tiger and Curly are also working on different levels of the Phonics Road. Curly’s spelling has improved dramatically and I’m so proud of her progress. Tiger is slowly learning some spelling rules and I know he will keep improving as we work through the levels. Curly and I love Getting Started with Spanish and she is learning an amazing amount of Spanish grammar and vocabulary through this program. All the kids are watching Salsa Spanish at lunch time and are picking up new words and phrases. I am loving the Bible program from Classical Academic Press and Curly and I enjoy working on that together. Tiger and Curly are working through Story of the World Volume 3 with me and we are adding in some extra books for each chapter. They are both really enjoying it and loving the extra book selections. Curly is moving quickly through Nancy Larson Level 3 and we are having so much fun with the topics. We are ahead of my little schedule. While I don’t write out daily lesson plans I do have a general idea of how many lessons we need to complete before the end of each semester if we want to have any hope of completing our curriculum for the year. Overall, we are working at a great pace and seeing progress in completing the work. I’ve revamped our schedule slightly and it’s working beautifully. I did have to move some afternoon things to the morning and switch some morning subjects to the afternoon so our day felt more balanced. I split our read aloud times move evenly as well, rather than doing all our read aloud time in the afternoon (because I was either falling asleep on the couch or losing my voice completely). We’ve had several little breaks throughout our semester for big field trips, little family trips, or time with family as they come into town. It has been so nice to have breaks to look forward to. In the times between the breaks I’ve been much more motivated to push forward with school so that we can enjoy our time off more fully. The kids are loving our read aloud time and I’m so thankful that it’s something that remains in our schedule. They enjoy sitting on the couch and listening to a wide variety of stories. Each week I have a new book for Curly, for Tiger, and for Bee and Ladybug. They each get their own time with me (with the exception of Bee and Ladybug who listen together) and they are always excited to see their new book for the week. I try to ask them some brief questions at the end of each chapter to check their retention and I’ve been pleasantly surprised with what they remember. I’m also thrilled with how their vocabulary has grown from listening to these stories. My kids could listen to me read aloud to them all day long. I unfortunately need to take breaks from reading. There have been numerous weeks because I’ve lost my voice from all the reading and talking I do (I promise it’s not from yelling!). So, my husband and I have set aside some of our budget toward the purchase of new audio books each month. My kids look forward to the new stories on their iPods and they listen to them in their rooms before bed and even in the car. It’s much better entertainment than TV or movies! When my kids can’t focus, are argumentative, or are just plain grumpy during the school day I stop for a mandatory exercise break. That child (or children) who are having a bad attitude or a difficult time with school work are either sent outside to play or to the treadmill to jog while listening to upbeat music. This has been one of the most wonderful and refreshing additions to our homeschool day. I have found that when my kids are done with their 15-20 minutes of exercise time, they are able to come back into the school room with renewed focus and attitudes and we can complete their work in record time. During the exercise time, I work with a different child or get some chores done. Curly had the experience of taking an online class this semester. It was wonderful! Her confidence blossomed and she developed a strong sense of personal responsibility as she made sure her assignments were complete for class. She also enjoyed interacting with students around the world and having discussions with them. Her teacher was passionate and enthusiastic and I felt like the class gave me a break from one subject (literature) for the semester. It was so freeing to know that Curly was receiving excellent instruction from someone other than me and I could use that time in working with another child who needed my help. Looking back on my major successes for the semester has been so encouraging for me and it’s made me feel more ready to tackle a new semester. I’m so thankful for the number of things that have gone well this fall!